The San Carlos Dinner Auction is our school's largest fundraiser of the year. This annual, fun-filled evening is spent mingling with parents, alumni and San Carlos School supporters while bidding on wonderful silent and live auction items. 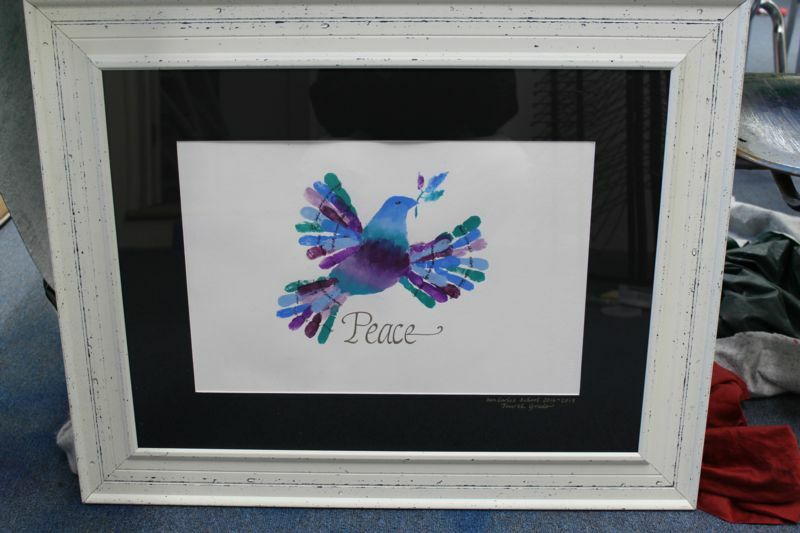 All items have been either donated from local area stores and businesses or hand-crafted by students for the event. The night also hosts a very popular Wine Toss game, a Cake Raffle, DJ and dancing. Our 50/50 Raffle winner is drawn during this event... our 2018 Jackpot Winner went home with $20,000! The Dinner Auction has set a goal to raise over $65,000. These monies will go directly to benefit San Carlos School and its students by helping to keep our tuition costs affordable. To make this fundraiser happen we need the help of our entire community. There are many ways to contribute. Below is a description of all the events that occur during the evening and some suggestions on ways you can help make the event successful. When and Where is this year's Dinner Auction? "Big Hats and Bow Ties, It's a Derby", our 33rd annual Dinner Auction, will be held Saturday, March 2, 2019, at the Monterey Marriott. Doors will open at 5 pm; Cocktails and silent auction will begin at 5:15 pm, with the dinner and live auction starting at 6:30 pm. Music, DJ, and dancing will follow! The Monterey Marriott is located at 350 Calle Principal, Monterey, CA. and can be reached by calling 831-649-4234. Tickets to this year's event are $85 each if purchased before February 15th. The price increases to $90 each after that date. Please see the files below for the invitation and reply card. Simply fill out the reply card and mail to the school, 450 Church Street, Monterey, CA 93940 and add the note: attention "Dinner Auction RSVP". During our silent auction, guests bid on items such as a night at local boutique hotels, themed gift baskets, golf packages, dinners at local restaurants, gym memberships, and artwork while enjoying local wine donated by area wineries. The live auction often includes such items as high-end wines, sports memorabilia, Family vacation packages to Disneyland, and private dining experiences. The live auction also features our coveted Class Art Projects. The Dinner Auction would not have any items for the silent and live auctions without the generosity of the community and our families. We ask our families to help by asking for donations from local businesses that they patronize, no item or donation is too small. We also have a committee that will make those calls and pick up items if needed. Contact Liliana Dawson via e-mail: Dawson@SanCarlosSchool.org if you would like to help or have questions. We also have a committee that will be assembling gift baskets and transporting them to the Marriott the day before the auction. This is a great way to get Time and Talent Hours. Contact Marieta Aranda - Cell: 601-2041 /Email: aranda4@sbcglobal.net if you are interested or have questions. What are the Class Art Projects? Each class has created a unique art project that will be auctioned off during the Dinner Auction. 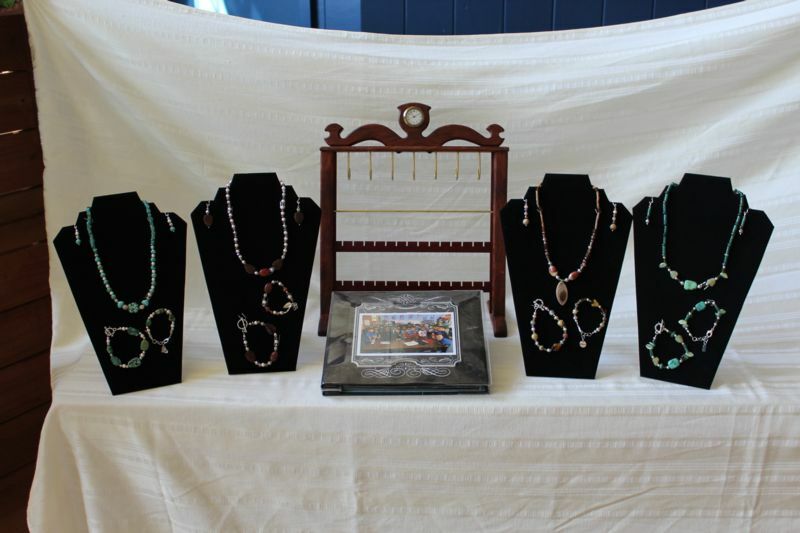 These are one of a kind pieces that often go for top dollar during the live auction. Interested parties can purchase a $50 Class Art Project drawing ticket prior to the event. When the ticket is purchased, please fill out your name, phone number and the class project you would like to win. One ticket from all the entries will be drawn prior to the beginning of the live auction. All of the other Class Art Projects will be auctioned off to the highest bidder! Here are a couple of examples from previous years. Every year they are different! You can help by selling your Class Art Project drawing ticket. You can always get more tickets to sell and increase your odds of winning. Parents, Grandparents, friends, and Alumni are some great starting places. What are the Class Baskets? 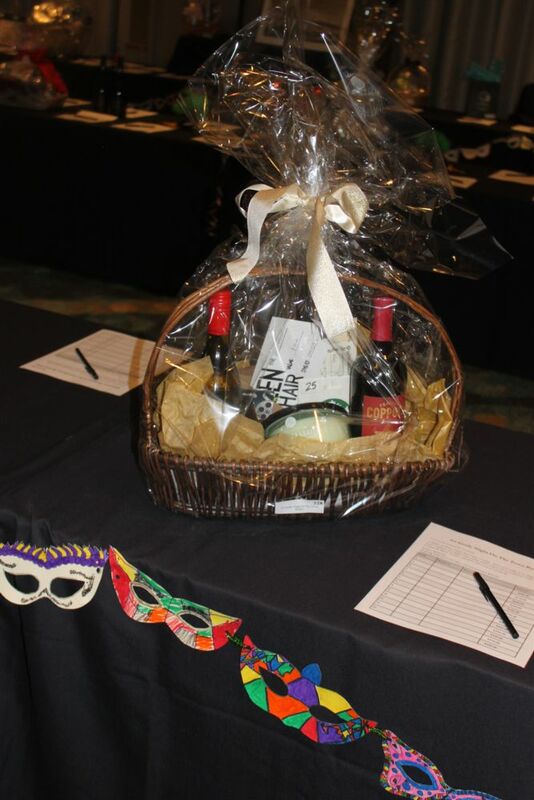 Several classes put together themed baskets that will be auctioned off at the dinner auction. These baskets are literally "bundles" of fun! By donating items to the class basket you help to make it more appealing to prospective buyers and increase the money that will come back to support San Carlos School. What is the Cake Raffle? Who doesn't like cake? If you are a cake lover you will want to be a part of this. Some of the finest cake bakers in the area make special cakes for our San Carlos Dinner Auction that will be raffled off on the night of the Dinner Auction. Each cake has a special surprise with it too. We will need people the night of the Dinner Auction to help sell tickets. Contact Teresa Bruzzone-Cell: 831-224-5777 / Email: tbruzzone@cardinaleway.com if you are interested or have questions. What is the 50/50 Raffle? Members of the school community sell $5 raffle tickets during the months leading up to the auction and during the auction itself. At the end of the auction festivities, the final drawing will be held where one name is drawn from all of the tickets sold. The winner receives 50% of the total amount sold! The school keeps the other 50%. The winner does not have to be present to win. The 50/50 raffle is a major part of our fundraising efforts for the Dinner Auction. A big total is good for the winner and for the school. Each family is given $100 worth of tickets to sell. We encourage you to sell more! If each family is able to sell $200 worth of tickets we will meet our goal of selling $40,000 worth of tickets. 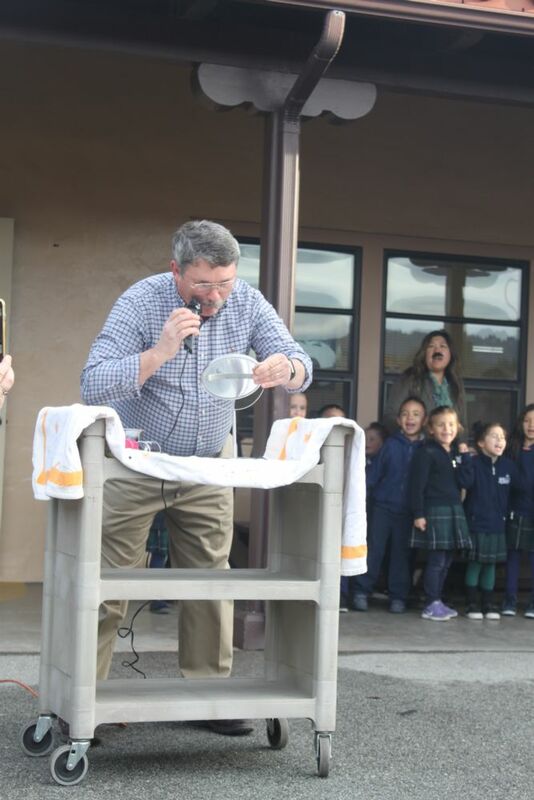 At $40K Mr. Kreeger will shave his mustache (check out the pictures below). You do not have to buy the tickets yourself but you can sell them to your family and friends. We also have opportunities to sell tickets after Mass at church. There are prizes for the top sellers as well as class participation prizes. Contact Mark Thomas - Cell: 594-7373 / Email: markt913@hotmail.com if you have any questions. 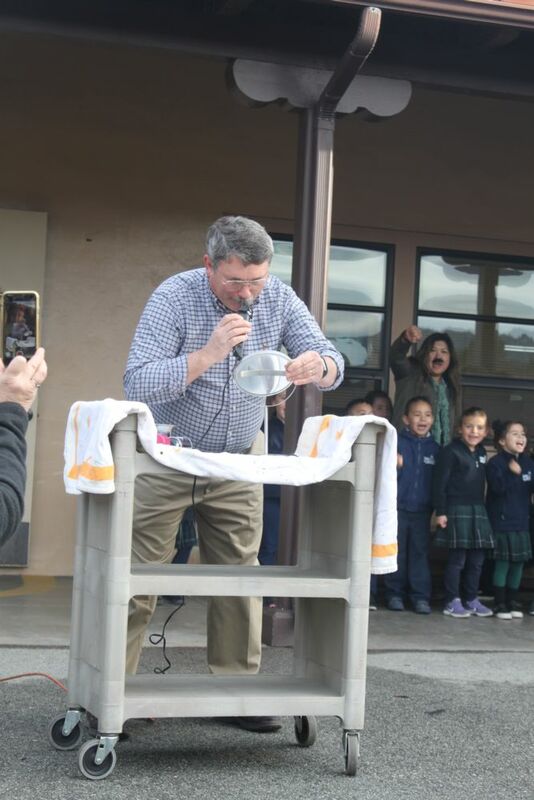 2018 was a success and Mr. Kreeger's Mustache was shaved off at morning assembly. It grew back quickly. Let's shave it again in 2019!! !